After decades of mostly ignoring bicycles, Singapore's authorities have recently become more positive. "Bicycle paths" are appearing but we may need more help to get them right. An example in Sembawang. A painted line separates pedestrians from bicycle users. The change in attitude is very welcome. But some of us here are worried about the designs of these paths. The photo below illustrates one problem. 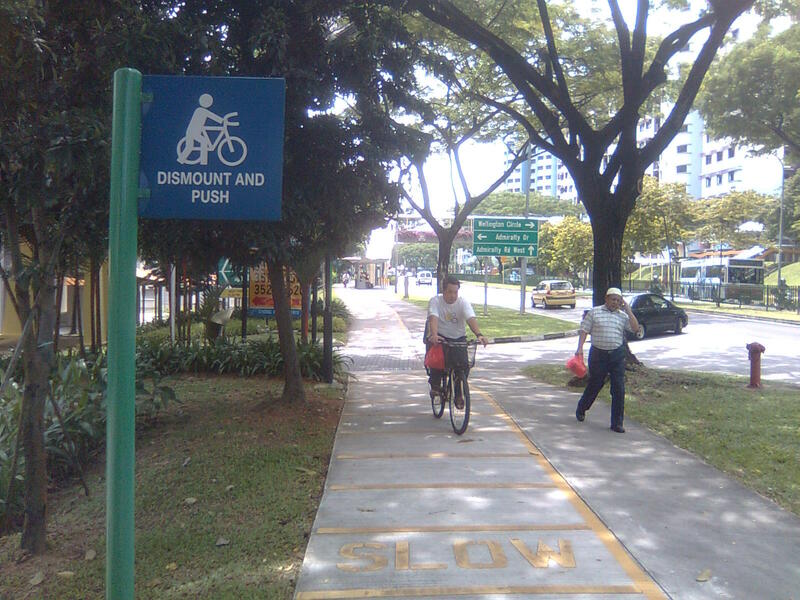 'Dismount and push' sign where the bicycle path meets the entrance to a parking area in the housing estate. 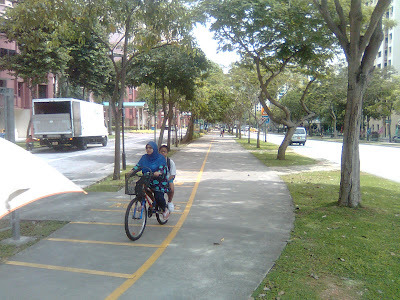 My recent post at Cycling in Singapore looks at the bike paths in one such town (Sembawang). Be aware that most bicycle use in Singapore is at very low speed, is for short trips, and takes place on the footways, which are usually much narrower than the paths shown here. Conflict between bicycles and pedestrians is an emotive issue often raised in newspaper letters and online forums. Riding on sidewalks/footpaths is illegal but ubiquitous. 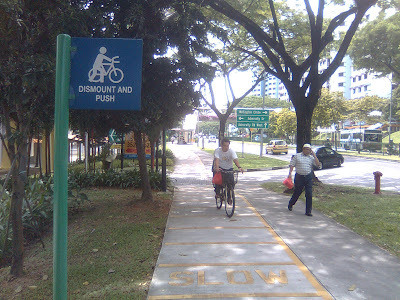 The exception is the new town of Tampines, which has taken the pragmatic step of making walkway cycling legal. This allows education and enforcement efforts in the hope of reducing conflict between the bicycle users and people on foot. However, bicycle paths are also being built in Tampines. Your views on this would be welcome. And they would be especially welcome if you have any experience with bicycle planning or if you know Singapore. So please do take a look at Sembawang's bicycle paths and consider offering a comment there to suggest how Singapore could do better. I've noticed recently that pedestrians are more receptive to cyclists if the latter are going at low-speed on the park connectors (which is shared between cyclists and pedestrians). Most cyclists on the Park Connectors are leisure cyclists and some are using the way to get home from the main roads/MRT etc. I agree there needs to be a much better integrated design infrastructure for cyclists and there needs to be more acceptance and tolerance for cyclists on our roads. I see a few foldable bikes on the trains and pple seem accepting of this as they are towards wheelchairs and prams. Yet on the roads is a different matter possibly because the coexistent level is not quite there. vehicles still honk at cyclists... impatiently. What do you guys think would be needed to encourage people to ride to work using the PCN? Would appreciate very much your views.